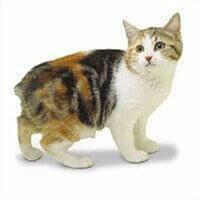 The Manx is a tailless breed of cat and differs from most cats in that it has no tail and its overall appearance is quite distinct as its hind legs are longer than the ordinary cat. And when this animal is on the move it runs similar to a rabbit and is exciting to watch. The reason for the missing tail is due to a dominant mutant gene that appeared in the animal a long time ago due to the breed's confinement on the Isle of Man that also led to its concentrated in-breeding. The mutant gene caused a spinal malformation that spread throughout the cat community resulting in the loss of the animal's tail. Hailing from the Isle of Man it is viewed as a wonderful cat, but a national curiosity as well - and that is fine by the inhabitants of the island because it is a truly unique cat. These delightful cats fall into four groups depending on their "amount of tail" - they are the "Rumpy", the "Rumpy-riser", the "Stumpy" and the "Longy". A Rumpy Manx has no tail at all while Rumpy-risers have a small knob of a tail, Stumpies have a definite tail stump and Longies look similar to ordinary cats. This breed of cat is a muscular animal and quite hardy, with a distinct double coat of many colours with soft under hair and a glossier topcoat. The Manx is a friendly and robust cat that will make an ideal family pet and be a sheer delight around the home. Treated the right way the Manx will return the love of its owner many times over. If you are considering adopting a cat, you will miss out big time if you do not let your curiosity extend to this breed.